Non-owner car insurance provides liability coverage when you don’t have a car and drive one that isn’t yours. Liability coverage pays for injuries and property damage you cause to others in a car accident. However, it doesn’t cover any damage to the car you’ve borrowed or rented, nor does it pay for any of your own injuries if you cause a crash. Beware: If you borrow a car from a relative or someone in your home, non-owner car insurance isn’t the right choice — you should be listed on the car owner’s policy. Depending on their insurer and your state, this might be required even if the car belongs to an unrelated roommate, and even if you don’t currently have a valid license. To get a quote, you’ll need to make a call or visit an agent. Insurers don’t tend to offer non-owner insurance quotes online, and some, like Progressive, offer them only to existing customers. And though most large insurers offer non-owner car insurance, Allstate does not. We’ve verified that the insurers below offer non-owner policies, but some don’t offer information online and most say the best way to get a policy is to find an agent. Insurers that offer the non-owner car coverage may not sell it in every state. *USAA sells insurance only to active military members, veterans and their families. Liability coverage for property damage and injuries you cause to others, except your passengers. Uninsured/underinsured motorist protection, which pays out if you’re injured in an accident caused by a driver without any or enough liability insurance. Medical payments or personal injury protection, which pay for your injuries after a wreck no matter who is at fault. Non-owner insurance doesn’t include collision or comprehensive insurance. In a standard auto policy, that coverage pays for repairs or replacement of the vehicle you own. Need an SR-22 form filed on your behalf — or an FR-44 form in Florida and Virginia — to get your driver’s license reinstated. These forms are filed by insurers and prove that you have car insurance after a serious conviction like a DUI. Your state requires insurance to get or reinstate a drivers license. Some states do so under what is sometimes called a “proof of financial responsibility” law. 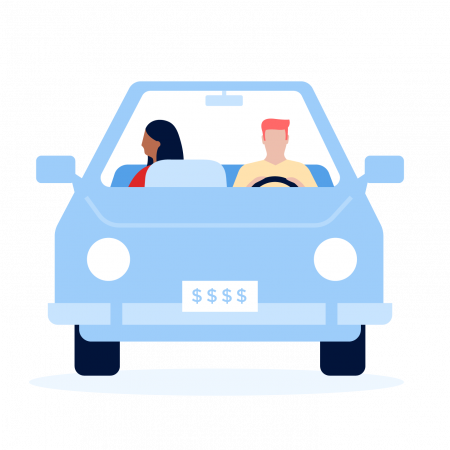 Use a service such as Zipcar or Car2Go: A non-owner policy supplements the liability coverage the car-sharing service provides, typically the minimum-required amount in your state. If you cause a bad wreck, costs could easily exceed those limits and you’d be responsible for them. Want to maintain continuous auto insurance coverage: Going without coverage — even between cars — makes you look risky in the eyes of insurers, leading to higher rates when you buy a vehicle. Rent cars frequently: Non-owner insurance might be cheaper than paying for liability coverage at the rental counter if you rent often enough. It won’t cover damage to the rental, but you may be able to get that coverage through a credit card or buy the collision-damage waiver from the rental car company. Borrow other people’s cars often: The car owner’s insurance normally pays out for an accident, but if costs exceed the owner’s liability limits, you’d be on the hook for the remainder. Typically, a non-owner car insurance policy costs less than what you would pay for the same level of liability coverage for a car you own. However, if you need the insurer to file an SR-22 or FR-44, costs will likely be high for any policy until you don’t need it anymore. The price depends on your age, driving record and how often you plan to drive, in addition to other factors.